The average Facebook and Instagram user sees a mind-boggling 1,500 posts a day. To give users a better experience, social media algorithms closely control who sees what in their feeds. This is great for users — but not so great for event organizers trying to get their posts in front of an audience. On average, only about 2-6% of your Facebook followers will see posts you make from your event page. “If you want to get your content in front of the right people, it’s a pay-to-play environment,” says Ali Shakeri, CMO and co-founder of ToneDen. That means supplementing organic posts with paid social ads. Shakeri has seen a lot of social ads in his time at ToneDen, so he knows what works and what doesn’t. 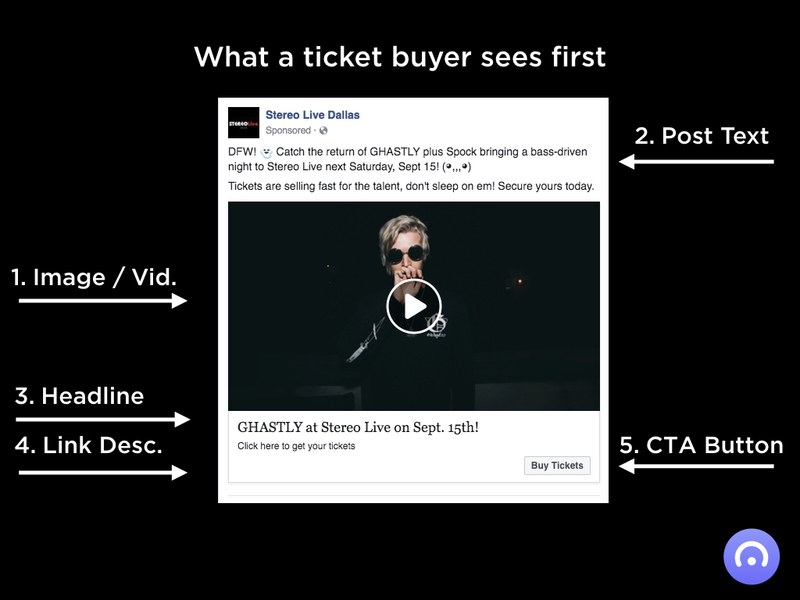 Here are the five elements of an ideal event ad, and Shakeri’s best practices for making yours a winner. The very first thing people notice about your ad is the image. To get them to stop scrolling and read your post text, choose carefully. “One mistake a lot of event organizers make is to simply use their existing event flyer, but that’s not usually the best choice,” Shakeri says. Event flyers tend to be busy and unreadable when shrunk way down. Instead, custom-make an image with Facebook’s recommended dimensions in mind: 1200×628. Because Instagram is now a Facebook-owned platform, ads created in Facebook can be automatically placed on Instagram as well. That means if you follow Facebook’s rules and best practices to create an ad, you’re also set up for success on Instagram. To make sure your image is as effective as possible, ToneDen conducts automatic AB testing — testing different versions of ads. From the data this testing provides, Shakeri recommends images that feature recognizable human interactions that inspire emotion. Video can be another great attention-getter in advertising. In fact, Shakeri says that ToneDen sees video ads convert at about twice the rate of still photos. (This is backed up by other research as well.) You can even merge the two formats — a stellar photograph as the thumbnail of a video. However, Shakeri recommends keeping video very short. The Instagram video limit for ads is 59 seconds, but anything over 20 is more likely to get flagged by a copyright violations filter. Even if your video is 100% legitimate, this can stall the publishing process. To expedite your ad publishing, keep videos short and create more than one ad. If one gets flagged, the other might go through quickly. The text is the meat of your ad. Within a meager 90-character limit, you have to cover all the basics: the who, what, where, and when of your event. And if you’re working with an artist or celebrity who has a signature emoji, using it in your post text can be a great way to align yourself with that person’s brand. Fans will recognize it before they even read the text. Headlines are even shorter versions of your story. With a meager 90-character limit on Facebook, how those characters are arranged makes a difference. ToneDen’s recommendation for headline length is to stick to eight words. To get there, Shakeri says, take your post text and distill it down to emphasize your message. Include the basics: the name of the artists or event, the venue name, and the show date. Keep the description; lose the flourish. The call-to-action button is a clear and obvious way for the viewer to click on your ad. When you create an ad on your own through Facebook, there are preset options for what your button can say. Unfortunately, “buy tickets” is not one of them, and that’s the wording Shakeri recommends based on ToneDen’s AB testing. Go into Facebook Power Editor, export your ad code into a CSV file, then change the words on the button manually and upload this custom button. Use a Facebook-approved app like ToneDen that has “Buy tickets” and other event-specific call-to-action buttons already embedded. Simply choose the option from the drop-down menu in the ad creator. This button is optional, but adding it can increase your click-through rate by 2.85x, so don’t skip this step. When done right, Facebook ads get your event information in front of the right people and increase your ticket sales. The more you know about the anatomy of an ad, the more you can choose your words and images carefully for best results. The best social advertising apps don’t just help event organizers get their ads in front of target audiences on social media. They also make automatic adjustments throughout the life of the ad campaign so you get the most for your marketing spend. To hone your expertise in advertising on Facebook and other social media platforms, download The Event Organizer’s Guide to Paid Social Media Advertising. Rachel is a writer for Eventbrite, where she regularly interviews organizers of the country's most popular events, from massive music festivals to small food & drink gatherings. She's a live music lover, a foodie, and a big fan of smiles.